Basemaps and Layersets 2019 - AgTerra Technologies, Inc.
With MapItFast, you can integrate Google Earth KMZ files or shapefiles into your projects. In fact you can build your own basemaps that work offline to serve as a reference while you map objects and collect data. Learn more about MapItFast objects, layers and basemaps to determine what works best for your projects and to pick up a few tips and tricks. MapItFastObjects are the most interactive type of map feature. Objects can be queried, selected, and edited. Users can tap on a point, line, polygon or photo to view a pop-up window with the object’s attributes. Attributes can be modified by changing the object name, description, or by adding a Strider form. If a user has “Edit’ capabilities within a project, he or she may move a point object or adjust vertices on lines and polygon objects. Because MapItFast objects are vector based and can potentially contain a large number of attributes, MapItFast limits users to 1,000 objects per import and 5,000 total objects in a single project. Exceeding this number could result in an unresponsive web browser, mobile application, or both. If you’re working with large shapefiles, it is a good idea to split the data into separate projects or consider creating a layerset or custom basemap with the data instead. Layers are map overlays that lay on top of any basemap. Layers may be vector datasets such as shapefiles that associate attributes with map features/objects or raster datasets such as a georectified maps from a third party. Layers of either type can be stacked on top of each other to serve as a layerset overlaid onto a basemap. Layers are useful when you want to view points, lines and/or polygons as an additional reference layer on a map and set to display differently at different zoom levels. 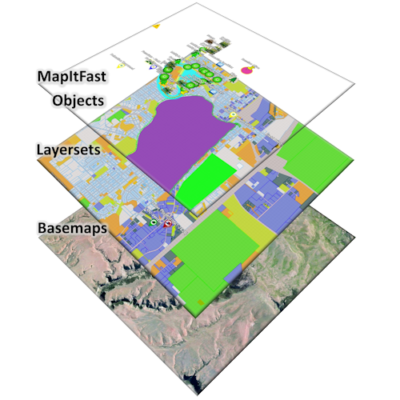 In MapItFast, basemaps are the bottom layer, layersets are in the middle, and map objects are displayed on top. Basemaps are individual images of a map (called tiles) generated at a particular resolution and stitched together to create a seamless map. 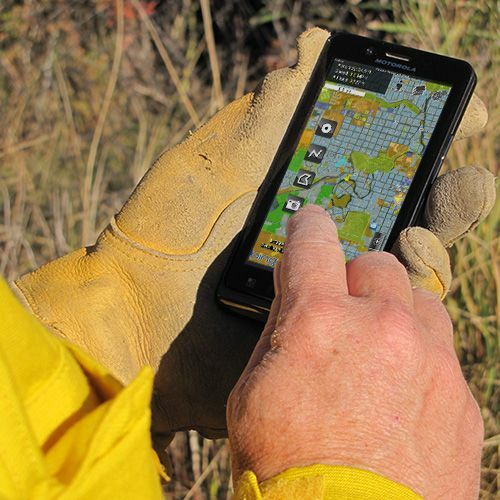 Map tiles make it possible for mobile devices to rapidly access and deliver map images. Basemaps in MapItFast can be viewed online (i.e. streamed via a data connection) or offline (i.e. accessed from the device’s SD card). For users who want to go beyond the default basemap options in MapItFast, custom basemaps are a powerful and customizable option. Custom basemaps are excellent for viewing maps with a lot of cartographic content or aerial imagery. They are created as “tile sets” at multiple zoom levels so that the map image is rapidly rendered for the user with optimum clarity. 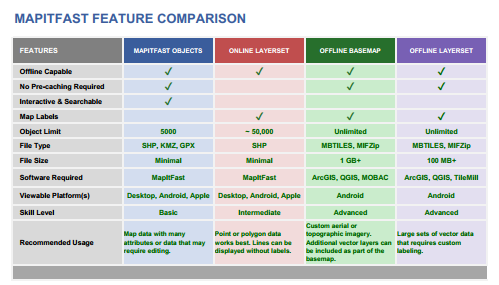 MapItFast accepts two file formats for custom basemaps: MIFzip and MBTiles. The following file types can be uploaded as MapItFast objects: Shapefile, KMZ, or GPX. Labels may appear jumbled or get cut off due to the rasterization and tiling of the layersets. This is most predominant in line and polygon layers. If label placement is important, consider building a custom offline layerset. Online layersets require a file in shapefile format. Processing time for the tile package can take anywhere from a few minutes to several days. Offline basemaps must be processed into a MIFzip or the commonly available MBTiles format. Vector layers are accepted in KMZ or shapefile format. Note that shapefiles are imported by combining the *.shp, *.shx, *.dbf, and (optionally) *.prj files into a *.zip file. Also note that data must be in GCS WGS84 or UTM projection. Raster layers are accepted as MIFzip or the commonly available MBTiles format. Get started quickly using objects, layers and basemaps. Below are some tips and tricks. 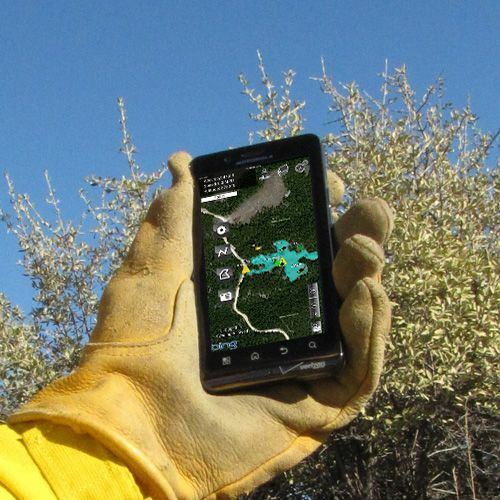 Use the device or a Bluetooth GPS to map points, lines and polygons or to place a geophoto. Simply use a quick tap on the appropriate icon on your device. You can also draw a point, line or polygon object by using a long press on the appropriate icon on your device or by clicking on the icon on the MapItFast web client. The most convenient way to upload raster layers are as MBTiles image format. Many third party software programs are available for this including MapBox and CalTopo. Google MBTiles to learn more. These are brought into MapItFast the same way as vector layers described above. Raster layers are not supported in online mode. For shapefiles, make sure that your data is in GCS WGS84 or UTM projection format. Zip the shp, shx and dbf files together. Include the prj file if it is available. KMZ files may be brought in directly. When using the a mobile device, save these files to your storage (preferably to your SD if available), select “Basemaps and Overlays” under the settings menu and follow instructions. When using the web mapping client, select the layers icon at the top and follow instructions. Vector layers are supported in online and offline mode. Access to individual online layers may also be controlled under user permissions. MBTiles are an excellent way to build your own custom basemaps that can be use in online or offline mode. Many third party programs including MapBox and CalTopo are available for doing this. Simply Google “MBTiles” to learn more. MBTiles may be brought in directly in the same manner as layers described above. Like raster layers, basemaps are not supported in online mode but are available in offline mode once uploaded to a device’s storage (preferably an SD card). Any map built in Esri’s ArcGIS may be converted to MBTiles format to use in MapItFast. This includes GeoPDF files that are uploaded into ArcGIS and converted to MBTiles. If you are interested in doing this, contact AgTerra for a converter tool. Call AgTerra TODAY to get started at (307) 673-1050. Include me on your list. Not interested at this time. For well over a decade AgTerra has enabled natural resource professionals to simplify data collection and reporting while delivering greater value to their customers. How can we help you? Contact us today for a FREE demo and let us help you learn how easy and affordable our technology can be for your workforce and operations. 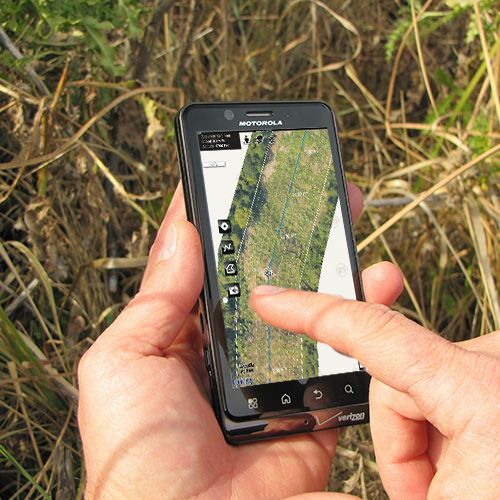 Since 2003, AgTerra has enabled natural resource professionals to gather, map and report data from the field. AgTerra’s mobile and Internet based applications are designed to be simple for anyone to use, anywhere. Our MapItFast, Strider, SprayLogger, and SnapMapper products help companies automate data collection, mapping and reporting with very little training.